Heat oven to 350ºF. Line bottom and sides of 9x13-inch rectangular baking pan with foil. Grease bottom only of foil with shortening or cooking spray. Stir brownie mix, water, oil and eggs in large bowl until well blended. Spread in pan. Bake 18 to 20 minutes or until toothpick inserted 2-inches (5 cm) from side of pan comes out almost clean. Cool completely, about 1 hour, on cooling rack. Using foil to lift, remove brownie from pan; remove foil. With 2 1/2-inch heart-shaped cookie cutter, cut 10 brownies. Place brownie hearts on a cooling rack or waxed paper. In microwaveable bowl, microwave frosting uncovered on High 10 to 20 seconds. Stir; frosting will be thick and spoonable. DO NOT BOIL. Carefully spoon melted frosting over brownies to glaze, allowing excess to drip down sides. Sprinkle with candy sprinkles before frosting sets. Special Touch: Mix 3 tablespoons Betty Crocker* Creamy Deluxe* Vanilla frosting and enough red food colour to make pink frosting in a microwavable bowl. Microwave on High 10 seconds. 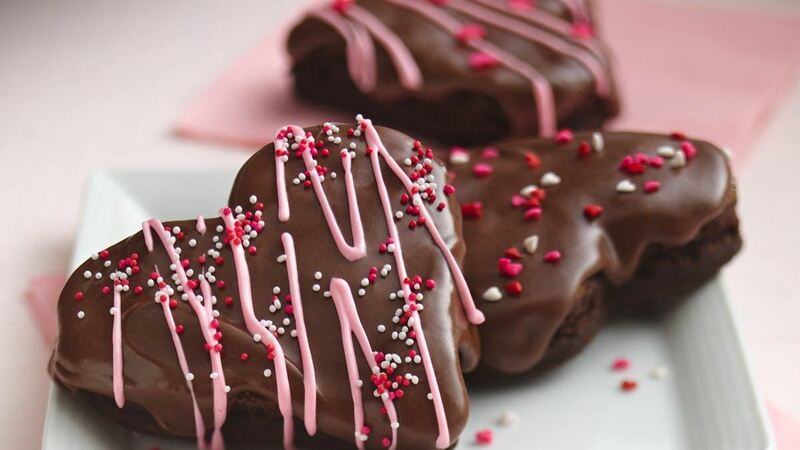 Drizzle over chocolate-glazed hearts. Hint: Place waxed paper under the cooling rack to catch drips when glazing brownies.